Good first impressions can put customers at ease and build confidence on your products and services. More often than not those first encounters take place on the telephone. Communicating by phone is still king, says Software Advice, a company which recently sponsored an online survey and analyzed 153 auto attendant systems across the country. “Forty eight percent of respondents say the phone is their preferred method for contacting a business for the first time,” the report states. That’s especially valid for local companies and seems to hold true for customers of all ages. One way companies can save money and impress customers is with an auto attendant that greets callers and routes them to the right extension. During business hours many companies – particularly those in the property management, retail, banking and health care industries – are using auto attendants to save time and money. Done well, auto attendant can make your company look smart. But when poorly designed, it can annoy customers and send them to your competitor. 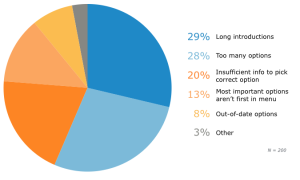 “Roughly 42 percent of consumers surveyed say they’ll take their business elsewhere after a frustrating experience with an auto attendant,” the Software Advice report says. To minimize mistakes and dropped calls, auto attendants must be simple, concise and follow a logical order. The main sticking points that annoy customers are long introductions and too many options. “Brief, punchy greetings and short lists of options are key to successful auto attendant design,” the report says. Keep company introductions under three seconds. Using introductions to boost branding can backfire and annoy customers. Try to keep menus at five or less options and roughly a minute long. Seven options should be the maximum. Descriptive listings will provide context and guide callers to the right selection. Offer options for departments rather than employees. Limit submenus, which branch off the main menu, to two or three options.